Job boards are the lifeblood of most carriers and their recruiters — reliably providing the recruiting pipeline necessary for carriers to meet their next round of drivers. With sometimes thousands of leads being amassed a month, recruiters own the arduous task of toiling through these leads one by one, weeding out the non-interested drivers. Not to mention the seemingly unavoidable loss of some leads that simply slip through the cracks – the nature of just about any manual process. Think of Job Board Scrubber (JBS) as your new virtual recruiter – one that doesn’t need sleep, food, or a smoke break. 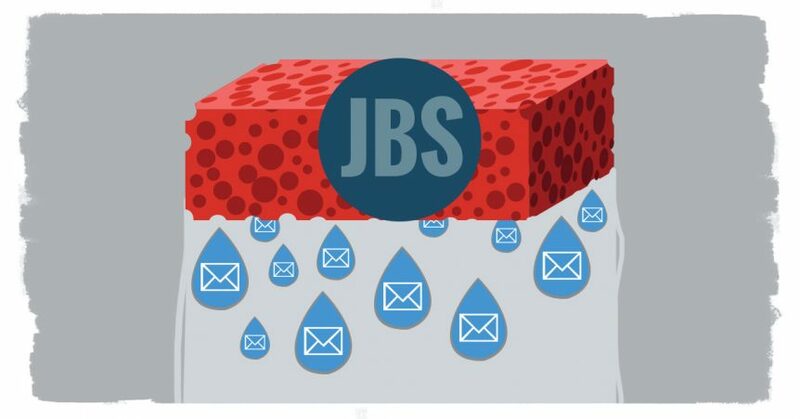 JBS works tirelessly, nurturing every lead for you immediately after they apply (when they’re hot), and then again in a series of well-timed, personalized emails. Each email JBS sent includes attractive messaging about your company along with an invitation to complete your IntelliApp. Instead of chasing down every job board lead that comes in, recruiters now can spend their time talking to the 6-11% of drivers who are actually interested (those who respond to one of JBS’s emails). 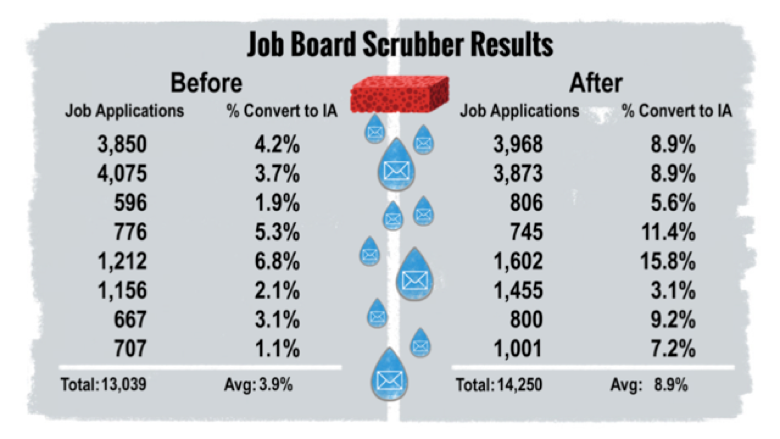 We conducted a study with eight of our clients who were graciously open to giving Job Board Scrubber a try. The results were incredible. Before Job Board Scrubber, recruiters successfully recruited an average of 4% of their job board leads using their old tried and true methods. After launching Job Board Scrubber, clients saw that conversion rate double, triple and even quadruple in some cases. One company even experienced a 540% increased conversion rate. The higher conversion rates proved that by focusing on the 6–11% truly interested candidates, recruiters were able to then convert more full IntelliApps to hires. Additionally, since emails are sent to every single job board prospect, leads never slip through the cracks. Every lead – every potential driver – is engaged. If you’re using our Drip Marketing service, this might sound all too familiar to you. Job Board Scrubber is just one campaign available in Drip Marketing – in fact, it’s become our most effective Drip campaign for carriers advertising to job boards candidates. In a side-by-side line up against other campaigns, JBS is always a top (if not the top) contender when it comes to converting subjects to full IntelliApps. Just like with any Drip Campaign, advanced reporting is included that provides a detailed breakdown on each mailing within each campaign, across each type of conversion (sent, read, clicked, started, completed, unsubscribed). You can see what’s really working, and what needs to be tweaked. These analyses also allow recruiters to prioritize contact with the remaining leads, based on who has read an email or started an application, versus those who have not even opened it yet. 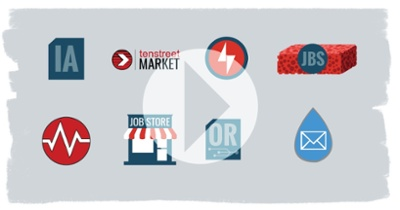 Simply put, it changes the way your recruiters pursue leads. Recruiters actually spend most of their time recruiting—we love it when that happens! Hire Your Own Virtual Recruiter Today! Ready to get your own JBS Virtual Recruiter? Reach out to your advisor, or contact sales today at sales@tenstreet.com or 877-219-9283. We look forward to hearing from you! Leah Kelly, thanks for sharing this informative post. The Job Board Scrubber is sure to simplify the life of a recruiter and help him or her use the valuable time doing work that requires more intellectual use. I really liked the concept and wonder when the virtual job recruiters will be a more common happening. I would also like some pricing on this. Hi Anna, thanks for writing in! I have let your advisor, Carlo, know of your request. He should be right back with you soon! Interested in getting pricing for Scrubber. Thanks, Felicia – I’ve notified your advisor, Carlo – he’s on top of it!